More than 65 journalists, bloggers and writers have been detained in Iran since last June's disputed presidential polls and could be tried on charges of "spying" for the foreign media, a New York-based media rights group said Tuesday. 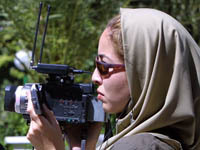 "The picture (in Iran) is pretty gloomy," Robert Mahoney, deputy director of the Committee to Protect Journalists (CPJ) told a press conference here as he presented a worldwide 2009 survey titled "Attacks on the Press in 2009" and highlighted the detentions in Iran. Maziar Bahari, an Iranian-Canadian correspondent for Newsweek who was jailed in Iran in June and released four months later, also told reporters that more than 100 journalists, bloggers and writers had been arrested at different periods since the elections, including the more than 65 who were still behind bars. "They can all be accused of spying for the foreign media," he said, noting that spying carries the death penalty in Iran. "The government has no respect for the privacy of individuals," Bahari said. "The strategy of the Iranian government is to make everyone's life, especially journalists' lives, insecure." And in an alarming development, Mahoney said Iranian authorities were now using online social networks such as Facebook to target journalists and dissidents. Mahoney said the CPJ was "monitoring more and more closely the government's attempt to censor and filter content online, to surveille journalists, to get into their contact books and generally try to disrupt their ability to use the internet as a tool for freedom of expression." Last week, the United States also accused Iran of trying "a near total information blockade" to deal with anti-government protesters, calling the move unprecedented. Based on US monitoring of networks and other information, State Department spokesman Philip Crowley said it appeared that "Iran has attempted a near total information blockade." He added that his statement was based on US monitoring that showed the phone network was taken down, text messages blocked, satellite television jammed and the Internet "throttled."